When we ask AEGEEans to nominate someone who did something important during a specific month, we often received nominations with the same name from five/six people. We never experienced an overwhelming number of nominations like we did with the Member of the Month of March: 25 in total! All with the name Naira N. Pérez Rodriguez from AEGEE-Tenerife. She was the main organiser of the Spring Break event in her local and her devotion towards participants impressed them, but also us. Here you have her honest and brilliant interview! The AEGEEan: Tell us something about yourself. Naira: My name is Naira N. Pérez Rodríguez, I’m 22 years old and I studied Law at the University of La Laguna, a warming (but not warm) and lovely city. Now I’m preparing the public examinations for being a judge. I’m in love with the law and the legal world. I know it can sound freaky, but I enjoy studying and arguing about the regulation of our country. I’m in love with the Canary Islands, which I consider a paradise. I was born in La Palma, the beautiful island, the jewel of the Atlantic. I’m in love with the sea and I love to swim: a way to be connected with nature where I can think without interruptions. But, among all, I’m in love with travelling. My trips’ philosophy is that the world is too big for repeating destinations. That’s why I don’t visit the same place twice; except for Turkey, thanks to AEGEE-Ankara, since I fell in love with that country, so I have to go again. I’m in love with music, as a way to express myself. Despite that I have no time for it now. I played drums and violin, but now I compensate with partying. I love to dance, above all, Latin rhythms. As you can see, in general, I’m in love with everything. And really, I’m in love. 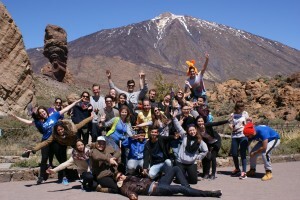 How, when and why did you join AEGEE-Tenerife? 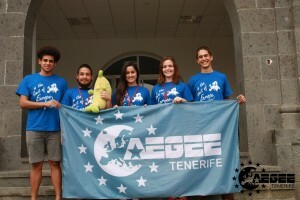 My relationship with AEGEE-Tenerife began with the Summer University campaign. Yes, of course, I was captured thanks to it. It was my first year in university and I saw a poster that said “Do you want to enjoy the best summer of your life?” and who could say NO to that proposal? In 2012, my adventure in Europe began with a Summer University organised by AEGEE-Cluj-Napoca, AEGEE-Gliwice and AEGEE-Pilicsaba. However, despite that I got back with too much willingness to get active, I couldn’t do much until I got back from my second SU, organised by AEGEE-Ankara. Just a few months later, I became president of AEGEE-Tenerife and I’m in my second term now. As I always say, AEGEE has given me more than I can give back. How does it feel to be elected member of the month? I don’t know how to define it. I didn’t expect it (and it is not the typical sentence of the Oscar’s winners). One of the participants of our European event “Spring Break in the limit of Europe” told me that she had nominated me, but of course, I didn’t expect that more people had done it. I really appreciate this award, but even If I hadn’t received it, just the nominations make me feel proud. I feel how my work has been recognised and, it has been a stimulus to go ahead. The funniest thing is that I almost did not realize that I had been awarded, because the email went to the spam folder and I don’t look in that one usually. Luckily we are in the Summer University campaign and the intranet registration of new members go to that folder too, so I enter it every day. One of the reasons of your nomination was the event in Tenerife. What was it about? And when? 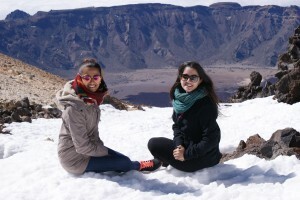 “Spring Break in the Limit of Europe” was an European event focused on the sustainability and environmental conservation, taking advantage of the endemic peculiarities of Tenerife, one island with an unquestionable and infinite natural heritage. 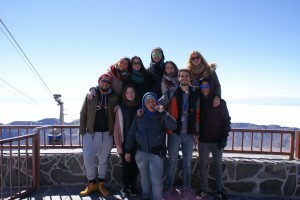 This event was created because one of the basic features of the islands and AEGEE-Tenerife: only a few of the members from this antenna are from Tenerife or they don’t stay on the island during summer. So if we couldn’t organise a Summer University, we had to show our beautiful island in other times of the year. It took place from the 18th to 23th of March, enjoying the Easter holidays. During this event, participants and a marvelous, fantastic, awesome group of 11 organisers, went, on the same day, to the highest point of Spain (our volcano Teide) and to a beach, changing gloves for swimsuits. We went across the North part of the island by hitchhiking and finished in a butterfly museum. We enjoyed a water park and had lessons about conservation and empowerment of local and natural heritage. We had a debate about the future of Europe and met La Laguna, an university and World Heritage city, and the capital of the island, Santa Cruz de Tenerife. All of that with their suitable doses of traditional Canarian food and party. People who nominated you said that you were very committed and you gave all for your participants. How important is for you this aspect when organising an event? Besides a compact and punctual timetable, to assure that the participants are pleased and enjoying the activities, it is one of the most important aspects of organising every event, because happy participants means motivated organisers with the will to work more. This creates an atmosphere where, if something goes wrong, the event doesn’t get ruined. As all the people that have met me know, you are my “dear Europeans”, so for me the human component comes always first. Did you passed the exam you had the days after the event? It is a hard question. Actually no, but it is not something to get worried about. For my public examinations, I have oral exams every Monday and Thursday where I have to recite, every time, one of twelve possible lessons, so actually if I don’t pass it one day, I can repeat it the next day. The final exam will be later on. In that moment I’m supposed to not fail, wish me luck. What are your future plans in AEGEE? I would like to get active on the regional and European level, as well as participate in an Election Observation Missions. However, I will have to wait until I finish with my public examinations. In AEGEE-Tenerife, I want to organise non-formal education activities, for facilitating and encouraging the training of members and non-members. In addition, after one year fighting with the University, now we can open our new office. Name one good thing and one bad thing in our association. In my opinion, the best of AEGEE is the opportunity of opening your mind, meeting new cultures and getting out of your comfort zone in every activity, event, etc. It is achieving a completely educated person, not only education wise, but personally too. A negative aspect is that (however, sometimes this is inevitable) is the favouristims and cronyism that can be observed in the assignment of particular positions, without keeping in mind the training and background of people. I think that, as a democratic association, we should decrease the non elective positions. Let’s play a game. Describe yourself by using adjectives that start with the letters that compose your name. NIMBLE: my mind is always hatching something. ACTIVE: I can’t stay at home. I always need to have something in my “to do” list. IDEALISTIC: Ideas move the world and I want to move it. ROMANTIC: I really love to love, despite maybe I’m not the best loving. AUTO-DIDACTIC: something totally required in AEGEE.